This Oahu helicopter tour showcases one of Hawaii’s most hidden treasures! Unstable cliff rocks have kept Sacred Falls closed off to the public for nearly two decades. This Oahu helicopter tour showcases one of Hawaii’s most hidden treasures! Unstable cliff rocks have kept Sacred Falls closed off to the public for nearly two decades. 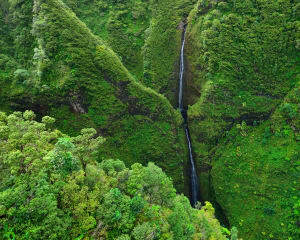 This means if you want to be wowed by the 1,000-foot waterfall, you need to get high up above the hiking trails. Hop in the chopper and get exclusive access to the Falls, known around these parts as Kaliuwa, plus fly over a stunning valleys and a number of other big attractions including Pearl Harbor and the world-class surf banks of North Shore! Take off from North Shore in an MD500 helicopter, which awards everyone with window seats! Fly over one of this planet’s top surfing destinations. Get aerial views of swells that reach heights of four-story buildings! Make your way to Sacred Falls and be one of the few to get perfect views of the towering wonder. Travel up close to the Ko’olau Mountains. You enjoy 40-minutes of flight time and the entire journey is narrated. Learn all about Oahu’s big attractions, hidden treasures and sacred landmarks that make the island so magical.